Acetaminophen is a medicine used to relieve pain and reduce fever. Acetaminophen is used to relieve many kinds of minor aches and pains—headaches, muscle aches, backaches, toothaches, menstrual cramps, arthritis, and the aches and pains that often accompany colds. This drug is available without a prescription. Acetaminophen is sold under various brand names, including Tylenol, Panadol, Aspirin Free Anacin, and Bayer Select Maximum Strength Headache Pain Relief Formula. Many multi-symptom cold, flu, and sinus medicines also contain acetaminophen. The ingredients listing on the container should state if acetaminophen is included in the product. The usual dosage for adults and children age 12 and over is 325-650 mg every four to six hours as needed. No more than 4 grams (4000 mg) should be taken in 24 hours. Because the drug can potentially harm the liver, people who drink alcohol in large quantities should take considerably less acetaminophen and possibly should avoid the drug completely. For children ages 6-11 years, the usual dose is 150-300 mg, three to four times a day. 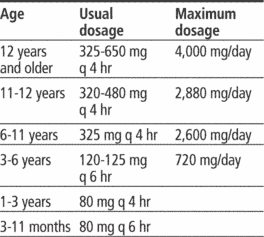 A physician should recommend doses for children under age 6 years. In 2004, the U.S. Food and Drug Administration (FDA) launched an advertising campaign aimed at educating consumers about proper use of acetaminophen and other over-the-counter pain killers. Often, acetaminophen is hidden in many cold and flu products and people unexpectedly overdose on the medicine. Some cases have led to liver transplantation or death. More than the recommended dosage of acetaminophen should not be taken unless told to do so by a physician or dentist. Patients should not use acetaminophen for more than 10 days to relieve pain (five days for children) or for more than three days to reduce fever, unless directed to do so by a physician. If symptoms do not go away—or if they get worse—a physician should be contacted. Anyone who drinks three or more alcoholic beverages a day should check with a physician before using this drug and should never take more than the recommended dosage. A risk of liver damage exists from combining large amounts of alcohol and acetaminophen. People who already have kidney or liver disease or liver infections should also consult with a physician before using the drug. So should women who are pregnant or breastfeeding. Many drugs can interact with one another. A physician or pharmacist should be consulted before combining acetaminophen with any other medicine. Two different acetaminophen-containing products should not be used at the same time. Acetaminophen interferes with the results of some medical tests. Avoiding the drug for a few days before the tests may be necessary. Acetaminophen causes few side effects. The most common one is lightheadedness. Some people may experience trembling and pain in the side or the lower back. Allergic reactions occur in some people, but are rare. Anyone who develops symptoms such as a rash, swelling, or difficulty breathing after taking acetaminophen should stop taking the drug and get immediate medical attention. Other rare side effects include yellow skin or eyes, unusual bleeding or bruising, weakness, fatigue, bloody or black stools, bloody or cloudy urine, and a sudden decrease in the amount of urine. Overdoses of acetaminophen may cause nausea, vomiting, sweating, and exhaustion. Very large overdoses can cause liver damage. In case of an overdose, immediate medical attention should be sought. In 2004, researchers announced that an injection to counteract the liver injury caused by acetaminophen overdose has been approved by the FDA. Arthritis — Inflammation of the joints. The condition causes pain and swelling. Fatigue — Physical or mental weariness. Inflammation — A response to irritation, infection, or injury, resulting in pain, redness, and swelling. Acetaminophen may interact with a variety of other medicines. When this happens, the effects of one or both of the drugs may change or the risk of side effects may be greater. Among the drugs that may interact with acetaminophen are alcohol, nonsteroidal anti-inflammatory drugs (NSAIDs) such as Motrin, oral contraceptives, the antiseizure drug phenytoin (Dilantin), the blood-thinning drug warfarin (Coumadin), the cholesterol-lowering drug cholestyramine (Questran), the antibiotic Isoniazid, and zidovudine (Retrovir, AZT). A physician or pharmacist should be consulted before combining acetaminophen with any other prescription or nonprescription (over-the-counter) medicine. "Antidote Cleared for Acetiminophen Overdose." Drug Topics February 23, 2004: 12.
an analgesic and antipyretic commonly used instead of aspirin, particularly for patients who are allergic to aspirin, are taking anticoagulants, or have peptic ulcer or gastritis. Unlike aspirin, it has only weak antiinflammatory effects and is not used to treat the inflammation associated with rheumatoid arthritis. Acute acetaminophen overdosage can cause severe and potentially fatal hepatic necrosis, when a large amount of the drug is accidentally ingested. One of the ways that the liver detoxifies the drug is by conjugation of a metabolite with glutathione, and when the glutathione stores are used up, the metabolite attacks the liver tissues. Treatment is symptomatic and supportive. Two drugs, methionine and acetylcysteine, can reduce the liver damage by serving as substitutes for glutathione. Unclear. Pain relief may result from inhibition of prostaglandin synthesis in CNS, with subsequent blockage of pain impulses. Fever reduction may result from vasodilation and increased peripheral blood flow in hypothalamus, which dissipates heat and lowers body temperature. Adults and children age 12 and older: 325 to 650 mg P.O. q 4 to 6 hours, or 1,000 mg three or four times daily. Or two extended-release caplets or tablets P.O. q 8 hours, to a maximum dosage of 4,000 mg/day. Or 650 mg P.R. 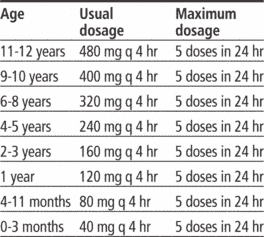 q 4 to 6 hours, to a maximum dosage of 4,000 mg/day. Or, two extra-strength caplets q 6 hours, to a maximum dosage of six caplets/day. • Be aware that although most patients tolerate drug well, toxicity can occur with a single dose. • Know that acetylcysteine may be ordered to treat acetaminophen toxicity, depending on patient's blood drug level. Activated charcoal is used to treat acute, recent acetaminophen overdose (within 1 hour of ingestion). • Determine overdose severity by measuring acetaminophen blood level no sooner than 4 hours after overdose ingestion (to ensure that peak concentration has been reached). ☞ Observe for acute toxicity and overdose. Signs and symptoms of acute toxicity are as follows-Phase 1: Nausea, vomiting, anorexia, malaise, diaphoresis. Phase 2: Right upper quadrant pain or tenderness, liver enlargement, elevated bilirubin and hepatic enzyme levels, prolonged prothrombin time, oliguria (occasional). Phase 3: Recurrent anorexia, nausea, vomiting, and malaise; jaundice; hypoglycemia; coagulopathy; encephalopathy; possible renal failure and cardiomyopathy. Phase 4: Either recovery or progression to fatal complete hepatic failure. • Caution parents or other caregivers not to give acetaminophen to children younger than age 2 without consulting prescriber first. • Tell patient, parents, or other care-givers not to use drug concurrently with other acetaminophen-containing products or to use more than 4,000 mg of regular-strength acetaminophen in 24 hours. • Inform patient, parents, or other caregivers not to use extra-strength caplets in dosages above 3,000 mg (six caplets) in 24 hours because of risk of severe liver damage. • Advise patient, parents, or other caregivers to contact prescriber if fever or other symptoms persist despite taking recommended amount of drug. • Inform patients with chronic alcoholism that drug may increase risk of severe liver damage. An antipyretic and analgesic, with potency similar to that of aspirin. /ace·ta·min·o·phen/ (ah-se″tah-min´o-fen) an analgesic and antipyretic with effects similar to aspirin but only weakly antiinflammatory. A crystalline compound, C8H9NO2, used in medicine to relieve pain and reduce fever. Also called paracetamol. an analgesic and antipyretic drug used in many nonprescription pain relievers. It has no antiinflammatory properties. It may be used with other products that do not contain additional acetaminophen. indication It is often recommended for the treatment of mild to moderate pain and fever. contraindication Known hypersensitivity to acetaminophen prohibits its use. It should not be used in persons with liver disease. adverse effects Among the most serious adverse reactions are anaphylaxis, hepatotoxicity, and hemolytic anemia. Overdosing can result in fatal cyanosis and hepatic necrosis. See also acetaminophen poisoning. An over-the-counter analgesic used for headaches, muscle or joint pain and fever. It lacks the anti-inflammatory activity of other NSAIDs. Overdose can cause fatal liver failure. Up to 10% of hospitalisations for overdose and 40% of acute hepatic failure is linked to acetaminophen overdose, which is more often accidental (e.g., children, alcoholics) than intentional (i.e., suicidal). Doses of > 150 mg/kg/24 hours will cause acute liver failure. 2. 24–48 hours: Right upper quadrant pain, tenderness with elevated liver enzymes. 3. 72–96 hours: Marked increase in liver enzymes; fulminant hepatic failure, coagulopathy, acidosis. 4. 4–14 days: Liver recuperates or patient dies. 90% is metabolised in the liver to non-toxic glucuronide and sulphate conjugates; 5% is oxidised by cytochrome p450 to NAPQI, which covalently binds to hepatocyte macromolecules, leading to hepatocyte death; 5% excreted unchanged in urine. Pain management should address both the nociceptive and neuropathic components of pain. uses: mild-to-moderate pain, fever; also used in combination with narcotic analgesics. See also Percocet. an analgesic and antipyretic drug in dogs. It is contraindicated for cats because of serious side-effects which include intravascular hemolysis, methemoglobinemia and hepatic necrosis. Defending Foody, Exdol Mitchell said: "He held a misguided view that the cat was suffering.